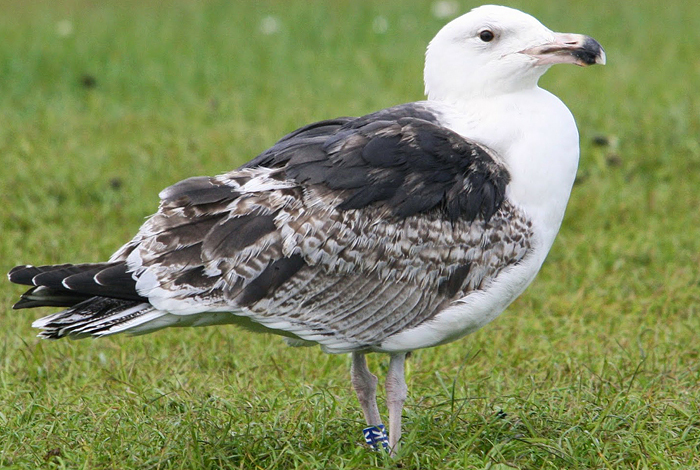 Great Black-backed Gull is highly variable in immature plumages, and ageing is not always straightforward. In general, 3rd cycle (4CY March) birds often show a complete black band on the bill and normally have a variable number of brown feathers in the wing-coverts. Sometimes there is black in the tail and especially the underwing-coverts are worth checking; immature brown markings may be difficult to detect in the blackish upperwing, but the white underwing-coverts show obvious brown crescents in immature plumage. Great Black-backed Gull (Larus marinus) JH688 2nd cycle (3CY), February 23 & 27 2015, Scheveningen, the Netherlands (Mars Muusse). Ringed as pullus at Buholmskjæret, Kristiansand, Vest-Agder, Norway. Still many immature feathers in the scapular region. Lower tertials with much marbling, a pattern that continues on the secondaries. 2nd generation primaries hardly have white tips and only weak mirror on P10. Great Black-backed Gull (Larus marinus) BTO J0658 2nd cycle (3CY), February 27 2007, Boulogne-sur-Mer, France (Jean-Michel Sauvage). 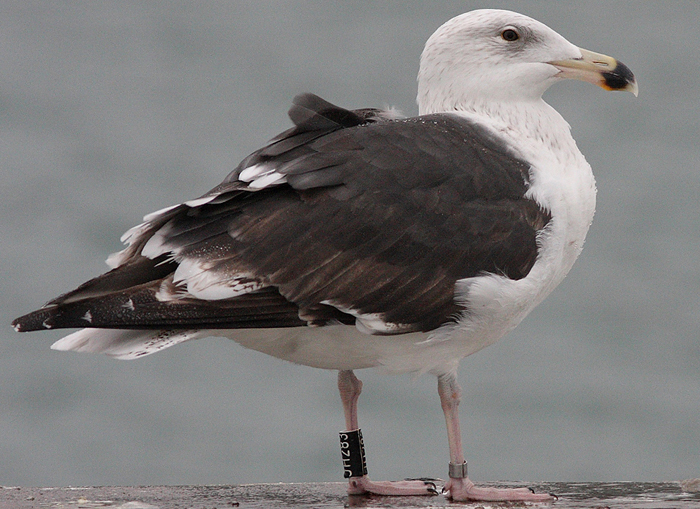 Ringed as pullus at Burhou near Jersey, U.K. More advanced looking bird with many blackish scapulars. Again, lower tertials are 2nd generation, with much lining; a pattern repeated on the secondaries. Broad tail-band and central primaries brown with very small tips. Weak mirror on P10. 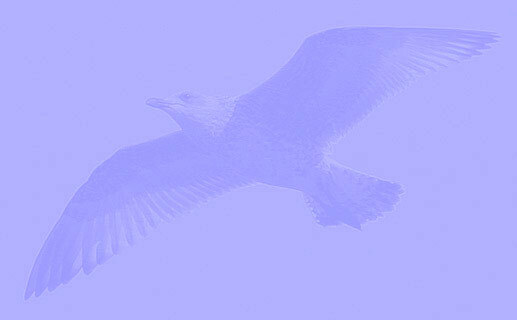 Great Black-backed Gull (Larus marinus) 1UK 2nd cycle (3CY), May 01 2014, Howth, Ireland (Graham Prole). 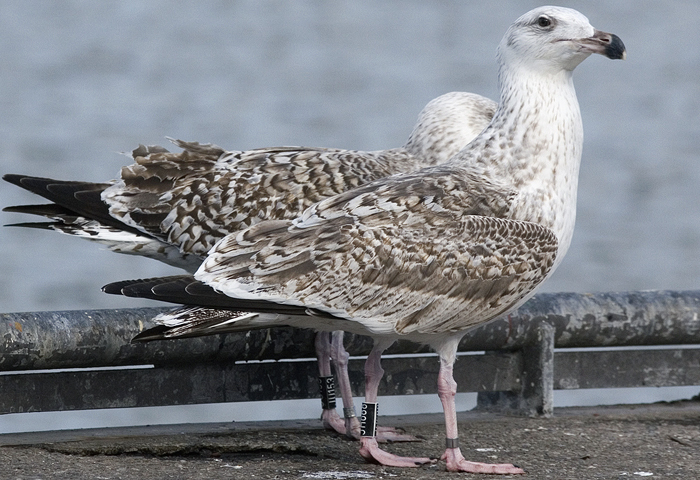 Ringed on the island Irelands Eye, near Dublin, Ireland White on head and underparts after the pre-alternate moult. Great Black-backed Gull (Larus marinus) JH283 3rd cycle (4CY), January 10 2013, Boulogne-sur-Mer, France (Jean-Michel Sauvage). Ringed as pullus at Merra, Lindesnes, Vest-Agder, Norway. Overall adult-like upperparts with various brown feathers mixed in. Tips on primaries larger than in 3CY. Only limited black in tail. Full band on bill. Great Black-backed Gull (Larus marinus) JA615 3rd cycle (4CY), February 01 2011, Scheveningen, the Netherlands (Theo Muusse). Ringed as pullus at Leiesundholmen, Mandal, Vest-Agder, Norway. Obvious mirrors on P9 and P10. Adult-like inner primaries and secondaries (grey centre with bold white tip). Great Black-backed Gull (Larus marinus) 48C 3cy, March 12 2009, Boulogne / Mer, France. Picture Jean Michel Sauvage. Great Black-backed Gull (Larus marinus) JA615 3cy, March 21 2010, Scheveningen, the Netherlands. Picture: M v Kleinwee. Great Black-backed Gull (Larus marinus) JC231 3CY, March 07 2018, Boulogne sur Mer, France (50.44 N - 01.35 E). Picture Jean-Michel Sauvage. Great Black-backed Gull (Larus marinus) JE610 3cy, March 31 2011, Amsterdam - IJburg, The Netherlands. Picture: Jan Zorgdrager. Great Black-backed Gull (Larus marinus) JT776 2CY-3CY, February 2015 & March 2016, Scheveningen & IJmuiden, the Netherlands. Great Black-backed Gull (Larus marinus) JU754 1CY-3CY, December 2014 - March 2016, IJmuiden, the Netherlands. Great Black-backed Gull (Larus marinus) JW187 3CY, March 01 2012, Boulogne sur Mer, France (50.44 N - 01.35 E). Picture Jean-Michel Sauvage. 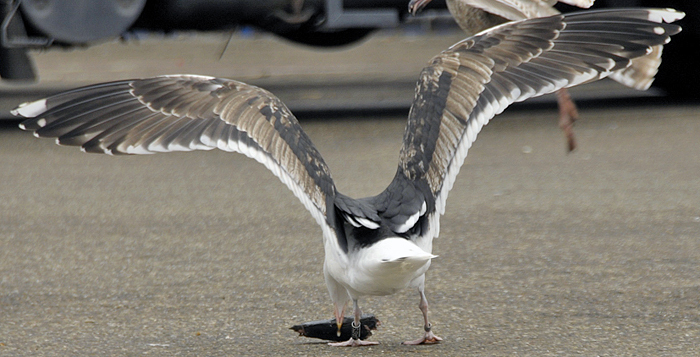 Great Black-backed Gull (Larus marinus) JYJ36 3CY, March 17 2015, IJmuiden, the Netherlands. Great Black-backed Gull (Larus marinus) JYY14 2CY-3CY, February 2015 & March 2016, Scheveningen & IJmuiden, the Netherlands. Great Black-backed Gull (Larus marinus) 1SV 3CY, March-April 2014, Howth, Ireland. Picture: Graham Prole. 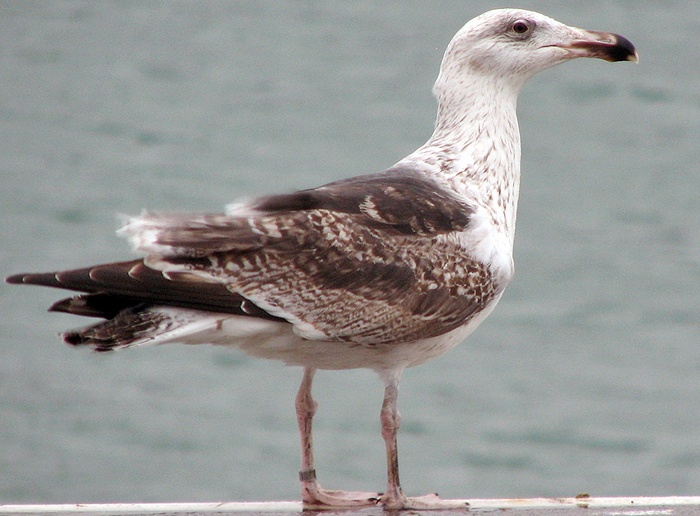 Great Black-backed Gull (Larus marinus) 1VA 1CY-3CY, September 2013 - March 2015, Dublin, Ireland. Picture: Graham Prole. Great Black-backed Gull (Larus marinus) 3CY, March 02 2017, IJmuiden, the Netherlands. Great Black-backed Gull (Larus marinus) 3CY, March 08 2016, Scheveningen, the Netherlands. Great Black-backed Gull (Larus marinus) 2nd cycle (3CY), March 06 2016, IJmuiden, the Netherlands. Great Black-backed Gull (Larus marinus) 3CY, March 16 2015, IJmuiden, the Netherlands. Great Black-backed Gull (Larus marinus) 4CY, March 17 2015, IJmuiden, the Netherlands. Great Black-backed Gull (Larus marinus) 3CY, March 02 2015, IJmuiden, the Netherlands. Great Black-backed Gull (Larus marinus) 3cy: March 14 2008, IJmuiden, the Netherlands.